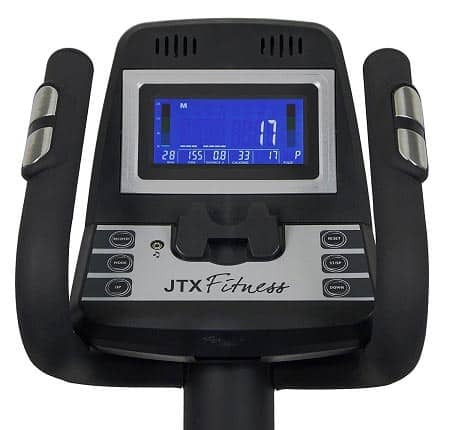 JTX Tri-fit Cross Trainer Review - Commercial Quality? JTX’s Tri-fit cross trainer offers the perfect compromise between quality, build and function. Built-to-last, this cross trainer is robust, with a variable stride length of 16″ to 20″, multi-user setup, 16 levels of resistance and 12 pre-programmed routines to help kickstart your fitness journey. It also featured in our home cross trainer reviews guide. JTX knows that users don’t want to spend hours assembling their cross trainer. The Tri-fit comes with instructions that are clear and helpful. When the company designed this cross trainer, they put assembly at the forefront of their must-make-easier list. The company ships the unit with all moving parts pre-assembled. The only moving parts that aren’t assembled on delivery are the handlebars. You’ll have an easy time assembling the handlebars thanks to the quick walkthrough provided. The item ships at 75kg, so it’s heavy. You’ll want to assemble the unit in the room that you plan on using it in. The good news is that transport wheels are included that allow you to move your cross trainer with ease. Assembly can be done by just one person. Designed for extensive use, JTX’s Tri-fit offers a full body workout with static and movable handlebars. JTX puts a lot of focus on their monitoring system (more on that soon), and they’ve also incorporated a built-in speaker system that allows you to listen to your favorite music while you exercise. Large footrests are incorporated into the machine’s design with anti-slip material to keep your feet in place during your workout. The machine features a 17kg flywheel that is able to offer near-silent operation even when the unit is on the highest resistance levels. You can be confident that tall and short users will be able to enjoy a full stride while exercising thanks to the variable stride length system. Users will have the stride length adjusted between 16″ and 20″ to offer full range of motion while exercising. Electo-magnetic resistance offers precision control while adding silent resistance to your cross training. You can expect to increase your fitness level and lose weight thanks to the resistance and incline options. Steel is used in the design of the frame to allow users up to 135kg to confidently use this cross trainer. And when switching users, the machine will use profiles to offer the utmost in customization during your workout. Despite the adjustable stride length options, the unit is 30% smaller than the competition, so it won’t take up additional space when assembled. Handlebars offer multi-position handles to provide a comfortable grip. The unit’s 70kg+ design is a testament to the quality that JTX offers. The steel is so durable that the company offers a lifetime warranty on the frame – it’s built-to-last. I have to mention the noise production of this model. The unit’s heavy flywheel is designed to produce low noise from the start. Heavier flywheels are also known for being much smoother. When you add in the magnetic resistance, you have a cross trainer that is quiet enough to use while the kids are sleeping without waking them up. There’s even a water bottle holder included to ensure you stay hydrated during your entire workout. Resistance is important if you want to build muscle and burn calories faster. Resistance levels are controlled with electro-magnetism. The 17kg allows for quiet operation as you switch through the 16 levels of silent resistance. The resistance levels are perfect for novices and athletes alike. A touch of a button is all that’s needed to move through each level of resistance silently. You’ll be in the midst of an intensive workout at maximum resistance and can rely on the unit’s Smooth-Drive system. A chest strap is included for heart rate monitoring, and the monitor allows you to cycle through incline and resistance levels. You can grasp the handles the entire time thanks to the resistance control buttons on the machine’s handles. You can set user profiles, too, to track your progress. There are 12 pre-programmed exercise routines built into the unit. You can also set your own customized programs to adjust your workout to your needs. It’s the perfect way to get your workout in without having to rely on someone else’s idea of the right workout for you. But the display gets even better than that. Bluetooth connectivity allows you to connect your cross trainer to motion video. 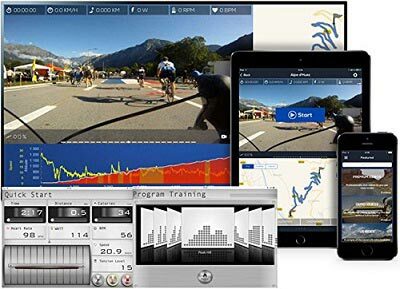 You can use the Kinomaps app to be able to exercise through courses and trails of your choosing. The unit will adjust to the resistance of the hills displayed on the screen. To find out more about the KinoMaps app Click Here. You can also use the I-Console app and Google Maps to work your way through responsive training routes. You can even exercise and pass your own house on the screen. Results of your workout can be shared with your friends on social media. It’s an advanced monitor that does more than the basics. Value for your money is the best way to describe this cross trainer. You can expect to pay around £700 for this unit. 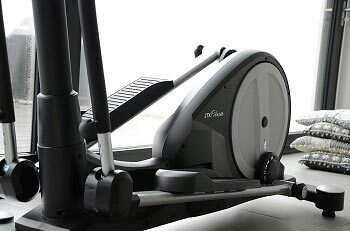 Designed for domestic use, this is an advanced cross trainer that will provide you with years of use. It’s the right price for the quality of the machine. Keep in mind that the JTX Tri-Fit is meant for domestic use. If you use this model in a health center, you risk voiding the warranty. It’s designed to be used daily by one user, but it’s still not a commercial quality machine. If your unit has anything wrong with it during your first two years, it’s covered. Customer service is very responsive to the needs and concerns of owners. If you do have an issue or have a question about your model, JTX will be quick to respond. And even users that have had to return units in the past praise the company’s commitment to customer service. Heart rate monitoring on the handles seems to be inaccurate and provides different readings than the chest strap. This is common with most handlebars, so it’s something that is somewhat expected. 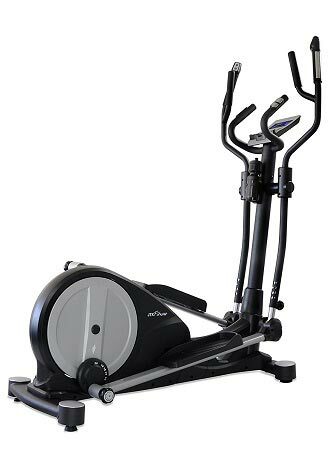 JTX’s Tri-fit cross trainer is an advanced cross trainer priced just right for users of all fitness levels. The cross trainer offers a visual experience via the iConsole app and Bluetooth connectivity, with ample resistance and incline levels to challenge even the most physically fit users. Add in the warranty and the quality build, and this is one of the leading cross trainers for home use. If you found our review of the JTX Tri-Fit useful then you might be interested in our review of the JTX Strider X-7, which has the same great build quality but costs a little less..